titanattachments has no other items for sale. 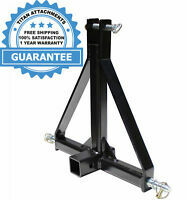 The Titan Attachments Clamp-On Pallet Forks can be used with tractor and skid steer loaders. These pallet forks can hold up to 4000 lb. 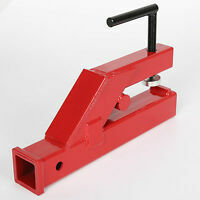 They have chain holes that can be used when lifting heavy loads. In addition, these pallet forks feature roll-back protection slots for safety. Sales tax may apply when shipping to: AL(8.0%), AR(6.5%), CO(5.0%), GA(4.0%), IL(6.25%), IN(7.0%), IA*, KS(6.5%), KY(6.0%), LA(8.45%), ME(5.5%), MD(6.0%), MA(6.25%), MI(6.0%), MN*, MS(7.0%), NE(7.0%), NV(8.25%), NJ(6.62%), NC(7.0%), ND(7.5%), OH(7.25%), OK(5.0%), PA(6.0%), RI(7.0%), SC(6.0%), SD(4.5%), TN(9.75%), UT(4.7%), VT(7.0%), WA*, WV(7.0%), WI(5.5%), WY(6.0%). Payment is required within 4 day of auction ending. WE LOVE PAYPAL. SHIPPING PRICE IS FOR THE LOWER 48 STATES. PLEASE CONTACT US FOR ALASKA, HAWAII AND CANADA SHIPPING RATES. We used these on a Koyker 160 mounted on a Yanmar 2620D. We used them in conjunction with some wooden racks designed to move sugar cane from the field. I was very skeptical and went so far as to be sure and mount the forks to the area where there are doublers in the bottom of the loader bucket near where the hydraulic cylinders attach. I did opt for adding my own chains with load binders. We loaded the rack until it became necessary to add ballast to the rear of the tractor. Not sure how much weight we actually had, but confident we didn't exceed the load rating on the forks. Best of all, no apparent deformations to the bucket or to the forks and they came off as easy as they went on. Yes, a skid adapter would have been nicer but this was so much more economical. Well built but it needs the cross support that's sold separately. After attaching these to my tractor I quickly found out that without the cross support bar you are going to keep knocking the forks off, unless you are highly skilled in using them. The clamps will slip off your bucket with slight bumps, no mater how tight you tighten them down. Aside from that, I find them very useful. The thing that bothered me more, was the fact that they were not shipped out in the timely manner promised by Titan and I had to wait an extra four days to get them while they sat in a FedX location (just three hours from my home) over the long holiday weekend when I expected to be using them. I dropped one star off my rating for the unnecessary shipping shipping delay. Just opened forks yesterday and used them for three different tasks. I found them very easy to mount, adjust and remove. I would recommend these to anyone who owns a home and a compact tractor. Cant wait to use them on my grapple load of wood. Maybe I wont have to stay bent over to cut the logs up ! Great product for my needs delivered on time and of the quality noted. I wish I had bought these years ago. These forks go on my bucket really easy and they are tough. They are actually tougher than I need but I do like overkill and for the price I could easily afford the heavy duty forks. I may have to put a brace in between them as I will rarely use them for pallets but I will use them for cow/horse panels, wood logs, boats, sawdust bags, plywood, pipes, and a whole bunch of odds and ends. The round weld at the bucket mounting point on top of these forks is about an 1/8 inch to big to fit snug on the front of my bucket. If this welded round bar was a little smaller this fork would fit snug on my bucket and the bucket would not allow this fork to move off the 45 degree mark from the bucket so I probably need a cross bar to keep it from moving. I know these are pallet forks and if I just used them for pallets this welded bar would cause me no problems but as I have stated I use these forks for a lot of weird things. I use these with my JD 790 front loader. I also have a 76 Massey skip loader and I have not yet used these forks for the Massey but it looks like they will work great. The chain mount holes on these forks are placed perfectly and come in handy for strapping the forks on my bucket with chains or tie down straps. The main mount bolt is really tough and keep the forks tight to the bucket. If it wasn't for that round welded bar I don't think these forks would move much at all. Today's front end loaders do not curl very far as they do not have enough strength to carry more than a level full bucket of rocks so these forks make it really nice for carrying logs and panels and such. I would tell anyone that is thinking about these forks to get them for sure. The sooner you buy these forks the sooner you will thank yourself. I could not believe the price as this is a great deal for the price. Be assured these are very well built, and well worth the money. I am using them on a New Holland TC30 4wd (30 Hp) tractor and they work great, the first time I used them I realized I should of bought a set of these a long time ago. I would get the stabilizers also.